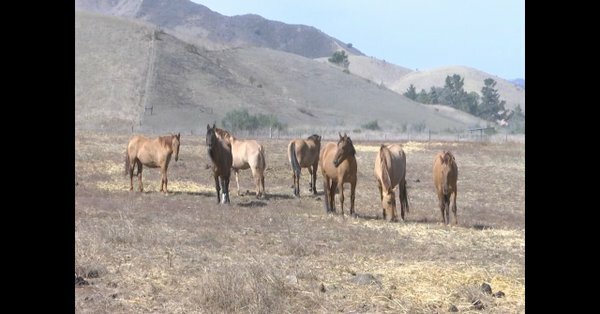 LOMPOC, Calif. – Next year marks the 20th year of operation for Return to Freedom Wild Horse Sanctuary which rescues wild horses and burros that are rounded up and removed from natural rangelands. The organization started on about 300 acres of land on Jalama Road south of Lompoc and has now grown to include hundreds of more acres in San Luis Obispo County. The owners of Flying Goat Cellars in Lompoc, Kate Griffith and Norm Yost, are supporting the work of Return to Freedom with a $2,000 donation and encourage others to do the same. The ongoing mission of Return to Freedom is to provide a safe haven for wild horses and burros that are rounded up and removed from their natural rangelands and sold. “Sadly many wild horses, many horses in general, end up being sold through auctions to slaughter,” DeMayo said. Return to Freedom keeps the wild horses in original family bands or social groups to ensure their emotional well-being and physical care. Many of the horses at the sanctuary live into their 30’s, well beyond the average lifespan . Return to Freedom also advocates for alternatives to standard wild horse management and lobbies the federal government for viable options other than rounding up and removing wild horses from their native environment. To learn more about Return to Freedom Wild Horse Sanctuary, sponsor a horse or schedule a school field trip, go to www.original.returntofreedom.org.